The Philosopher’s Walk is a very popular stroll beneath the newly sprung cherry blossom trees in Kyoto. 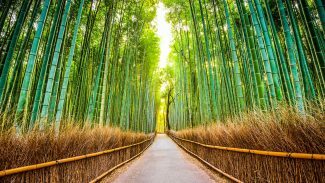 The Arashiyama District’s bamboo forest is also a very peaceful setting that is perfect for a long, quiet walk. Shakuhachi flutes are made from bamboo, and provide a very peaceful, ambient sound when played.